Tavis and his brother, Monroe, went to the art museum in the big city. It was filled with paintings and sculptures. Tavis’s favorite part of the museum was the pottery. He stood, gazing through the glass at all the different types and colors. There were some vases, some urns, bowls and baking pots. He had an idea. When he got home that afternoon, he was going to make some pottery. His Uncle Tormod had given him some clay for a birthday present. When he arrived home, he ran into his room and looked for his clay. He found it under his bed. He pulled it out and opened the lid off the can; a frown came across his face. It was dried out. It was nothing more than a pile of crumbs. He walked over and dumped it out in the wastebasket, then sat on the floor, feeling very sad. Monroe happened to walk past and saw his little brother looking very unhappy. "What’s the matter?" he asked. Monroe looked into the wastebasket and saw the dried out clay. "I know another way to make clay," he told Tavis. Tavis’s eyes lit up. A smile spread across his cheeks. "You do? You know how? Tell me!" he cried out with glee. "Come with me," Monroe said. Tavis followed his big brother out into the back yard. They walked to the very back, near the cinderblock fence. "Sit right here," Monroe ordered, and then walked away. Tavis watched as Monroe picked up a bucket and filled it with water from the outside tap. He then carried it over and poured it out on the ground in front of Tavis. "Our soil has a lot of clay in it. Just mix the water with the dirt and you’ll have clay. It’s not the same as the kind Uncle Tormod gave you, but it will do. What do you want to make?" he asked. "I want to make a big bowl, like the kind we saw at the art museum. 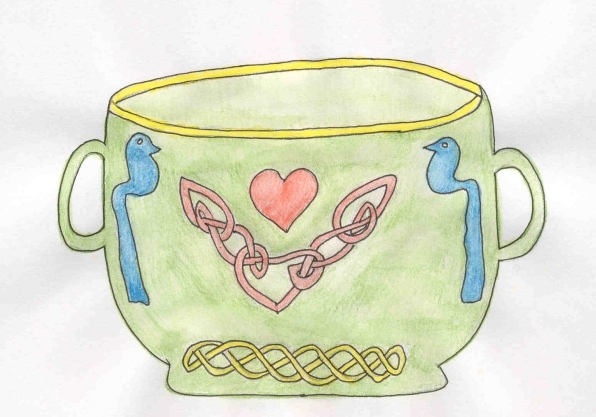 After it dries I want to paint ancient Celtic symbols on it," Tavis told his brother. "Well, start creating," Monroe said, then walked away, leaving his little brother to make his bowl. Tavis stuck his hands in the mud and started mixing it with the water. It did have a lot of clay in it and was rather hard to mix, but he kept trying. Soon he had a pile of clay-like mud. He started shaping it into a bowl, carefully squeezing it together. If he needed to stick parts together, he rubbed water on it. He made the bowl and then added handles on the side. When it was finished he sat back and looked at it. Monroe came outside to see how his brother was doing. "That looks great, Tavis," he congratulated. "I think you need to let it dry in the warm summer sun. It won’t take long." "Okay," Tavis agreed. They left it sitting there and went off to play a game of ball. Later on that day, just before the sun was about to set, Tavis ran to check on his pottery. It was hard as a rock. He picked it up, being very careful not to hold it by the handles just yet. He carried it inside and put it on the workbench. He found his paints and paintbrush. Before he started painting he spread paper out on the bench, so paint wouldn’t drip onto it. Then he put on an old shirt, over his clothes, so paint wouldn’t get on them. He filled a glass full of water and went to the bench. He thought about what he wanted to paint. At the museum, some of the pottery had crosses, flowers, birds, squiggly lines that looked like water, and even some faces. There were a lot of choices. Tavis began to paint. Monroe came home and looked for his brother. When he walked into the room he saw Tavis painting. He was just finishing up. "Why, Tavis, that looks just like the pottery at the museum. You’ve done a good job. I love those birds that you painted; good job!" Tavis smiled. He looked at the bowl. It did look good. He’d used gold and brown, green and blue, and all the colors in the Celtic books he’d looked at. He felt happy and proud. He thanked Monroe for helping him and telling him how to make clay from the dirt. After the paint had dried, he carried his bowl into his bedroom and put it on his shelf. As he lay in bed later that night, he could see his pottery. He smiled and then went to sleep.